Out of Florence came the idea to do Vinci, where Leonardo da Vinci was from, bolstered by the fact that according to the Stellplatz book and the camper app, it was a free site with services! After bidding farewell to Florence, finding a camper accessory shop on the way out for toilet chemical, I headed for the hills. Only by the time I had made it to the hills, that I didn’t know were coming, and after getting exceedingly lost in one way systems on the way out of Florence to the camper shop, my sat-nav took the scenic route, much to the dismay of my petrol gauge and the fuel pump whenever we weren’t precisely horizontal. But after the expenses of the city of culture, I was determined to not buy petrol this side of Vinci. Coasting down the hills, I thankfully pulled in to the camper stop with about 10 miles left in the tank! So anyways, it happened that the week I am planning on being here, is a festival for the town, and there is a fair amount of free entertainment going on in and around the town for the next few days. 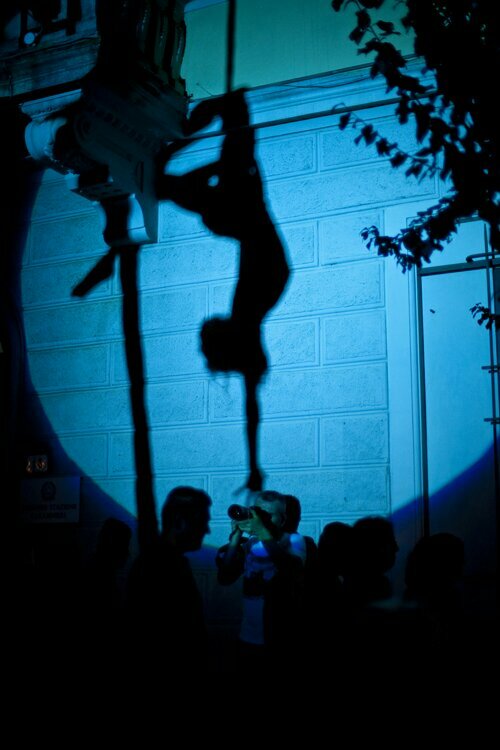 My first evening, was a troupe of girls that danced on ropes, and though they were very, very good, I was more impressed with the interaction of their shadows and their audience. I think I took over 500 photos in two hours! I did manage to share the best of them on Flickr and on the troupes Facebook page. This is one of my faves from the set with the official photographer of the community I believe. Over the next couple of days was Italian singing and dancing and a re-enactment of an event from Leonardo da Vinci’s life which involved something to do with a man being threatened with death and Leonardo saving him by flying, culminating in a firework display. The most impressive thing about this event was the amount of people involved with no lines, just walk on parts, that were completely overshadowed by the two massive oxen drawing the cart of the condemned man! Mahoosive!!! and lots of interesting gadgets. The town itself is in amongst a network of hills and has some beautiful scenery, summing up nearly the whole of Tuscan heritage in one town. The townsfolk seemed very friendly and I almost felt like staying til the end of August, but the draw of more interesting sites pulled along and so I upped-sticks and headed off for the promise of Lucca. 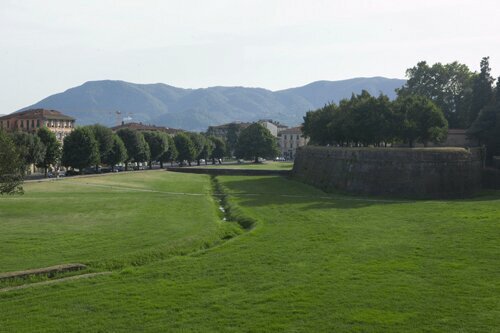 The thing with Lucca being an impressively intact walled town, is the equally impressive one-way system, or for the non-native, the impressively infuriating. And again, on finding the carpark listed as free in the camperlife app, it is under renovation with a prohibition order for ‘sosta’ or stay over. It did have a conveniently long and legal disclaimer with the possible relocation of 10 spaces allocated for sostas at an indeterminate location for lay men. The impressively expansive lorry park/market area equally gained a prohibition order conveniently during my first day out, after my one night there, so that meant packing up and moving to the sports ground car park that I had discovered someone else camping in the night before. I think I have managed to circumnavigate the old town about four times during my stay. Firstly was a complete lap of the outside of the wall, followed by a complete lap of the inside top of the wall, which impressively again, was the size of a dual carriageway! But then for the amount of human traffic of an evening up there either walking, running, cycling or skating, it needed to be! Lucca has managed to impress again in its one-upmanship of Florence in bizarre things to have in churches. I found two churches with glass coffins containing the actual whole remains of people on show, not just fingers or teeth. Though I have yet to find out more info on her, the most impressive was Santa Zitae, who has almost withered away to nothing save her floral headdress, all the while in her presence I have “Oh What a Circus” from Evita playing in my head. With the uncertainty of the parking, and wanting to be at the coast for the weekend and running out of walls to walk round/on, I packed up and headed for Pisa. Having spoken to a Belgium man in Florence about how there was pretty much nothing going on apart from the tower, one night seemed to be the order of the day, especially as it is a pay site and with services so that I am set up for the non-serviced coast site. After landing, I headed off to do the done thing and get a phone photo of me in front of the tower. Well, me and five thousand tourists and a miniscule white thing in the background somewhere!